Do More Expensive Wines Taste Better? : They should! It’s a cardinal rule: more expensive items are supposed to be qualitatively better than their cheaper versions. Believe it or not, the most dominant flavor may be the dollars. Thanks to the work of some intrepid and wine-obsessed economists (yes, there is an American Association of Wine Economists), we are starting to gain a new understanding of the relationship between wine, critics and consumers. So why do we pay so much attention to critics and connoisseurs who tell us otherwise? Also featured: Steve Levitt, who admits his palate is “underdeveloped,” describing a wine-tasting stunt he pulled on his elders at Harvard’s Society of Fellows. Also, you’ll hear from wine broker Brian DiMarco (featured in the forthcoming documentary Escaping Robert Parker) who pulled a stunt of his own on his very wine-savvy employees. DiMarco also walks us through the mechanics of the wine-purchase business, and describes how price is often a far-too-powerful signal to our taste buds. I mean, S&P, Moody’s, Fitch, these people all rated securities that apparently completely tanked. So there’s obviously something in the demand for expertise, the imprimatur, which is not really about the fact that they do a good job. By the way, those organizations are not transparent either, just as the Wine Spectator isn’t. So there’s some similarity here that I think probably gives us a little insight into things that are much broader than wine and food. And there was just one classic moment when one of the French judges by the name of Raymond Oliver, who was the owner of the Le Grand Vefour restaurant, he had a television show on food in France, he was a big thing in French wine and food circles. He had a white wine in front of him. He looked at the white wine, then he held it up to a light to look at the color very closely. Then he took a sip of it. Then he held it up again. Then he said in French, ‘Ah, back to France.’ And I looked down at my scorecard and he’d just tasted the 1972 Freemark Abbey Chardonnay. Wishing you the happiest of holiday seasons, and urging you to spend $15 instead of $50 on your next bottle of wine. Go ahead, take the money you save and blow it on the lottery. * You can hear Ashenfelter in a related Marketplace piece that aired recently. Brian Wansink at Cornell has done work in this area: the exact same wine placed in different bottles received better marks when drunk with a fancier label. The exact same food tasted in different ambiences scored much better in the nicer ambience. Our perceptions are contextual. The Wonderous Operation of the Free Market, has had high demand and limited Supplies leading to high prices of wine. Then suppliers began to increase production, leading to new wineries in California, Chile, Australia, South Africa, and Washington State and Oregon. And these low priced wines break the phenomenal $4.00 / bottle barrier. As Chinese vintners enter the market, we will see wine approach the price of Coca Cola. If the taste is a little imperfect, at least it is easy on the wallet. And that sensation will last longer than the taste will linger on your palate. I remember seeing a study (I can't remember if it were posted here or on another site) showing that while most people who have been trained to appreciate wine were able to consistently identify good wines from bad. most wealthy people who actually collect wine are completely inept at actually being able to "taste the value" so to speak. The context of the article was who wine counterfeiting was becoming such large problem. If you watch the Oz and James Wine Adventure series on BBC you will clearly see that yes there is something to growing wine and yes the market is rather out of whack when it comes to pricing and quality, but there are many instances where wines do earn their value. The take away from the series is that one can certainly get a very good wine for a modest price (under 10$), to get a wine that will provide a transcendent experience you're going to have to pay for it. However one must work very hard to train their palette to ever appreciate such a wine. Re #4: "...to get a wine that will provide a transcendent experience you're going to have to pay for it. However one must work very hard to train their palette..."
So who's better off, the person who works very hard (and spends lots of money) seeking that "transcendent experience", or me, who derives equal pleasure from the expensive wine and the $5/bottle stuff? I believe wine drinkers can taste the difference between good and bad wine, but not necessarily cheap from expensive. How about a comparison of the severity of hangovers vs the price of the wine that was drunk? 2 Buck Chuck vs. Opus One. A milder hangover in itself might be worth shelling out a few more dollars. Around 1960, when I was still a child in Orange, CA, my parents had a "blind" wine tasting party. This was when wine snobbery was just becoming a mass phenomenon. My parents and their guests were amused to find that some of the favored wines were Gallo products, with reasonably-priced Almadens as the overall crowd-pleasers. Years later, as a young adult in San Francisco, I went to a neighbor's wine-tasting party. He was a wine wholesaler so we had a heck of a selection. And this crowd tended toward some fairly strong wine snobbery. But once again, mid-level and low-cost California ordinaries were the faves. Today, in my kitchen we have some cheapie Marsala for cooking and Early Times bourbon (cheap stuff) that I sip on and offer to guests. (My wife is a non-drinker.) I have some beer snob and liquor snob friends. When they come over, they bring the fancy drinks they prefer. Everybody's happy. Where you buy your wine from may have as much to do with how it tastes as anything. 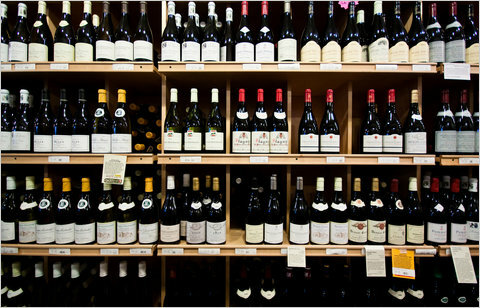 Wine shops that do not adequately control the temperature of their wine inventories can easily ruin a good wine. Unfortunately the drinker usually doesn't know the life the bottle has had from the winery to their home. It'd be interesting to test the tasters and see if supertasters get different results. Because wine prices seem somewhat scatter-plotted against quality, I'm not sure you'd get a good correlation to price as such, but you might get more clearly identified differences in perceived taste. That said, there's a lot of good $5-$8 wine out there, and it's the $20 segment I tend to avoid as most likely overpriced for the quality. Perfectly good Merlot, Cabernet, Shiraz and Chardonnay can be had at Walmart Superstores here in Texas for $3 per bottle. When someone else pays for them, they do. I like wine, but I have always naturally thought wine snobbery to be BS. To me there's your bad wines, like white zin, Carlo Rossi and things like that, which upon tasting are clearly bad. Then you have everything else. This "everything else" includes all the most expensive wines you can think of and basically everything they have at Trader Joe's, from 2.99 Charles Shaw and upward. I honestly cannot tell the difference between three buck Chuck and a bottle down the aisle that costs 25 dollars from France. There are taste differences, clearly different fruits and spices being used, but as far as "better" or "worse"? Impossibly subjective. Thus, I only mix up my labels when I go wine shopping simply for the taste differences. The quality and enjoyment of each one is basically the same, depending on the individual--some like dry and spicy, some like fruit. In conclusion, there is "bad" and "good." I've been all around Sonoma, and they're all the same. I find beer to be much more variable and allows for a more accurate interpretation of both quality and choice of additives. "Good" and "bad" wine is a subjective determination dependent on who is drinking it. Many winemakers want a high parker rating, so they fashion wines accordingly; overextracted "fruit bombs". the vast american winedrinking public likes oaky wines, so oak chips or oak extract are popular. Lots of folks buy wine because they like the label. "Perfectly good Merlot, Cabernet, Shiraz and Chardonnay can be had at Walmart Superstores here in Texas for $3 per bottle." Perfectly good for a Texan willing to enter a Walmart Superstore, perhaps. But these people eat deep-fat-fried pig's ears, drink Coor's Light, and thing the Longhorns are something special. If you enjoy it, drink it. As a wine-drinking economist I find this subject fascinating. Supply and demadn are compounding the effects descibed as massive over-planting of vines and excess wine productoin are changing the industry. High end wines are both being poured out and being bottled under lower-priced labels. I agree that in general there's not a strong correlation between taste and price, especially in whites. High end reds tend to get cellared for longer periods than cheap ones, so the label gets a better reputation because the wine has been properly aged. Find an old vintage Heitz Martha's Vineyard Cab or BV Georges deLatour Cab and you'll taste what a big red should be like once the tannins are subdued. Chances are those wines weren't left in a truck trailer in 103 degree heat for a week either, a fate sufferted by cheap wines all the time. Beware special sales of whites. I've never been able to discern the difference between a $10 bottle of wine and a $50 bottle of wine. I've often thought the overblown descriptive rhetoric was just a lot of nonsense and people were judging hype more than taste. This comment has been rated very highly by the Comments Association of America. It's oakey undertones, complex bouquet, elegant mouthfeel, lush and grippy palate, and fruity aftertaste combine to create a highly valued comment. The experts and our imaginations take over when we are not honest about what we like, because unlike the experts who rate stocks and bonds, the only expert that matters when it comes to assessing our own enjoyment of any wine is ourselves. If we aren't honest with ourselves about what we like, then we are going to wind up fooling ourselves. The plain truth is the world has never made better wine at all price levels and of all types and styles. These studies are amusing, but they don't help people develop the confidence to know and accept what their taste buds tell them they like & enjoy, no matter what label & price tag is on the bottle. If you love Gallo's Hardy Burgundy even though it is neither hardy nor burgundy, but does cost $10 a gallon, so what! There's nothing wrong with you and there's nothing wrong with that wine either. This is really shocking. The next thing you know we will be told that some really expensive contemporary art is no better than cheaply priced pieces done by unknown amateurs. I appreciate the contrarian's desire to put a pin in the balloon of those who seek to gain social status by means of an expensive habit, but I think you guys are conflating several groups into one. There are many people who drink expensive wine because it is expensive, with all that that entails, as a primarily social exercise. These people are not the same as the people who drink it for aesthetic pleasure, although the Venn diagram of the two groups would show significant overlap. Furthermore, the paper that he cites does not, in my opinion, show enough information about subject selection--were these people experienced in tasting? Did they have strong opinions about wine already? While Mr. Dubner does show nuance in his characterization, I am given pause by the post modern propensity towards throwing the baby out with the bathwater--that is, because some people who claim to be experts/connoisseurs have turned out to be less than genuine, therefore all expertise is immediately suspect and void. That having been said, there IS good wine to be had for less than 10$/bottle. Two buck Chuck is swill-if you like it, you are welcome to it. If cheap wine was good, the world would be my oyster. I truly wish it was so. Of course that does not mean all (or even most) expensive wine is great either.